Eradicating or preventing mosquito problems naturally requires a multi-prong approach, so before we get into how to prevent mosquito bites with mosquito repellent plants, let’s look at some of the other steps you should take along with additions to your landscaping. The first step is to make sure there is no stagnant water in your yard. Standing water provides breeding habitat for mosquitoes. Since these unwanted pests are tiny, even a small bit of water is enough, so you will need to be diligent when seeking out spots. Some places you may find stagnant water include in the saucers under flowerpots, clogged gutters, buckets left outside during rain, your child’s plastic pool, or anything left outside that can hold even a small amount of water. If you have a pond or fountain, make sure the pump is working and regularly recirculating the water. If you have a swimming pool or hot tub, keep it clean, maintain proper chlorine levels, and cover it when not in use. Your next step is to create an environment where adult mosquitos will not want to hang out. One way to do this is to install a ceiling fan on your patio or portable fans in your outdoor living areas to keep the air moving. This will discourage mosquitoes from hanging around. You may also want to try lighting citronella or geraniol candles before your next party to use this inexpensive, well-known method for warding off insects. As you will see below, you can also use citronella grass to get the benefits of a mosquito repellent without the chemicals often found in candles. Next, install a bat house to encourage these nocturnal feeders to spend more time in your yard. Bats usually eat larger insects, but they will eat mosquitos as well, which makes them a natural, effective pest control option. You can repay their efforts by providing them with safe, comfortable shelter. 1. Rosemary – The most effective way to use rosemary as a mosquito repellent plant is to use sprigs as a grilling seasoning or toss some into your fire pit or patio fireplace. The smoke created from burning rosemary wards off mosquitoes. 2. Sage – Like rosemary, sage is more effective when burned, so add this one to your fire pit or fireplace to keep mosquitos away from your family and guests. 3. Basil – Most natural mosquito repellent plants need to be crushed to be most effective, but this is not the case with basil. Plant basil in pots that you can use as centerpieces or place around your outdoor living areas to ward off mosquitoes. As an added benefit, you will always have this fragrant, flavorful herb on hand when preparing meals. 4. Marigolds – Marigolds are a mainstay when it comes to natural pest control. Often planted around vegetable gardens to keep pests from eating food plants, they can also be planted in flowerpots in your outdoor living areas to help keep mosquitoes away. Marigolds produce pyrethrum, which is used in commercial insecticides, so you know this is a solid choice for pest control. 5. Citronella Grass – Citronella grass, which is often found under the name citronella plant at nurseries, contains an oil used to naturally repel mosquitos. To be effective, the grass needs to be harvested and crushed. You can then rub the crushed grass on your skin or place it around outdoor living areas as a pest repellent. 6. Citronella Geranium – Some plants sold as citronella plants in nurseries are not citronella grass, but rather, they are citronella geraniums, which are sometimes also called mosquito plant geraniums or just mosquito plants. These geraniums give off the scent of citronella and can be helpful in warding off pests, but are not as effective as crushed citronella grass. 7. 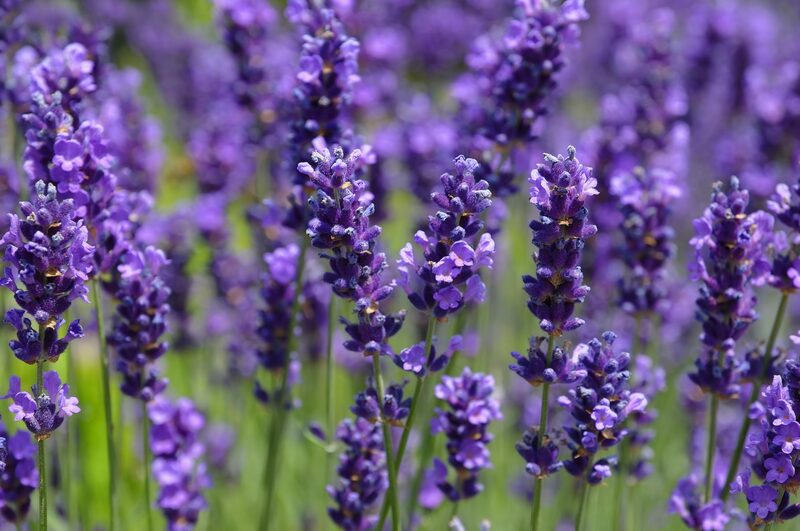 Lavender – Lavender is a gorgeous addition to your landscaping, is drought-tolerant once established, and is easy to grow, so this one should be on your list of natural mosquito repellent plants to consider. You can crush lavender buds and rub them on your skin, plant them along walkways, or place them in flowerpots at the corners of your patio. This option brings the lovely fragrance of lavender to your outdoor living areas and has the added benefit of warding off flies. 8. Mint/Peppermint/Catnip/Lemon Balm – Members of the mint family, particularly peppermint, lemon balm and catnip, are easy to grow and good for naturally keeping a variety of pests at bay. To use these mosquito repellent plants, crush the leaves to release the fragrant oil that mosquitoes do not like. Peppermint and other mints are also used as natural rodent deterrents, so that is an added benefit. Mints are invasive, so you will want to keep them under control by planting them in pots or borders. 9. Lemongrass – Lemongrass is sometimes confused for citronella grass, but they are two different plants with different qualities. One quality that they share is the ability to ward off mosquitoes when crushed to release their oils. 10. Garlic – Growing garlic in your garden is not going to keep mosquitoes away, but you can juice the bulbs and mix that juice with water to make an all-natural, mosquito-repelling spray to use on surfaces in your outdoor living areas.